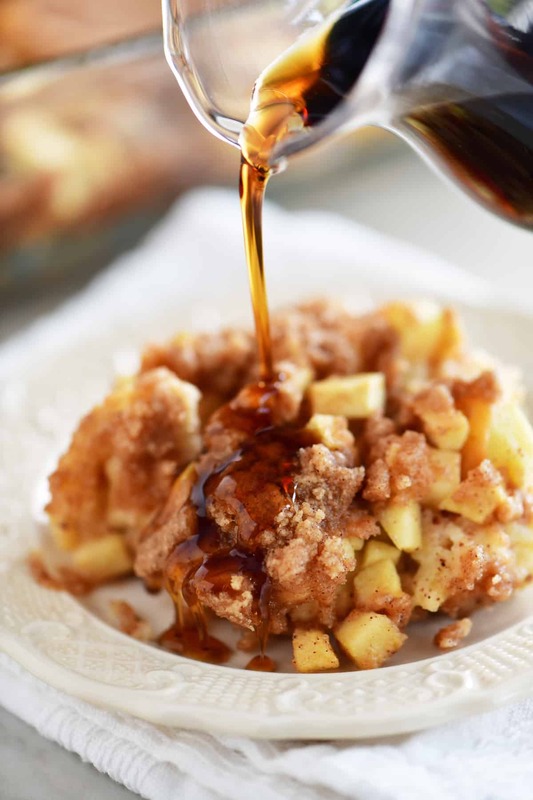 Apple Cinnamon French Toast Casserole is the perfect breakfast for fall weekends, overnight guests, or holiday brunch. It can be prepared the night before! There’s nothing like starting the day off with a delicious breakfast and I love it when I can make breakfast for everyone at once. It only takes about 15 minutes to prepare this french toast casserole and then you can sit back and drink a cup of coffee while it bakes. 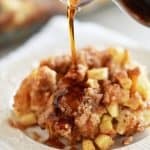 Where is the Apple Cinnamon French Toast Casserole recipe? In this post, I will share step-by-step instructions with photos for how to make the breakfast casserole, as well as answering FAQs about the recipe, giving suggestions for more breakfast ideas and showing a video of the recipe. But you can go directly to the recipe by scrolling down to the bottom of the post. Cut the French bread into slices and then into cubes. Spread them out in an even layer in a greased 9×13 inch pan. Peel and dice two apples. Sprinkle the apples over the bread cubes. If preparing this the night before, cook the diced apples in the microwave, in a small bowl, for 2-3 minutes before adding them to the casserole. This will help prevent the apples from browning. 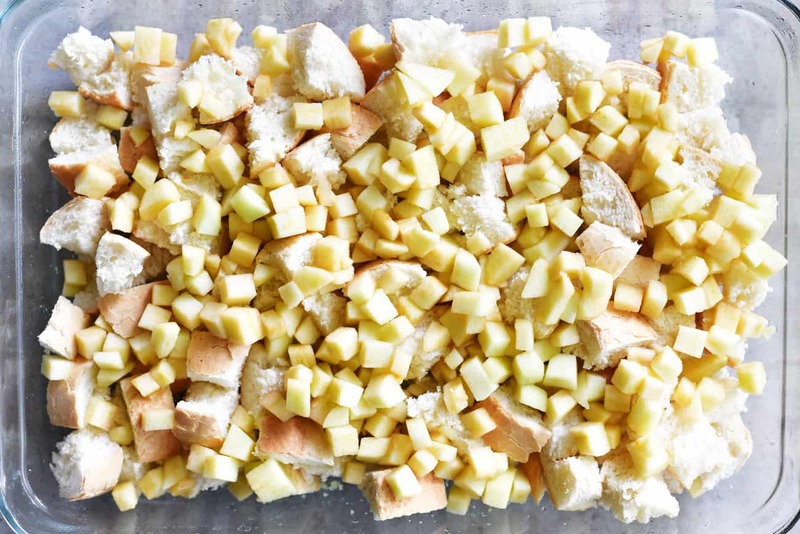 If you are planning to bake your french toast casserole right away but you want to make sure the apples very soft, you can microwave the diced apples for 2-3 minutes before adding them to the casserole. This will soften the apples some and then they can finish softening in the oven. 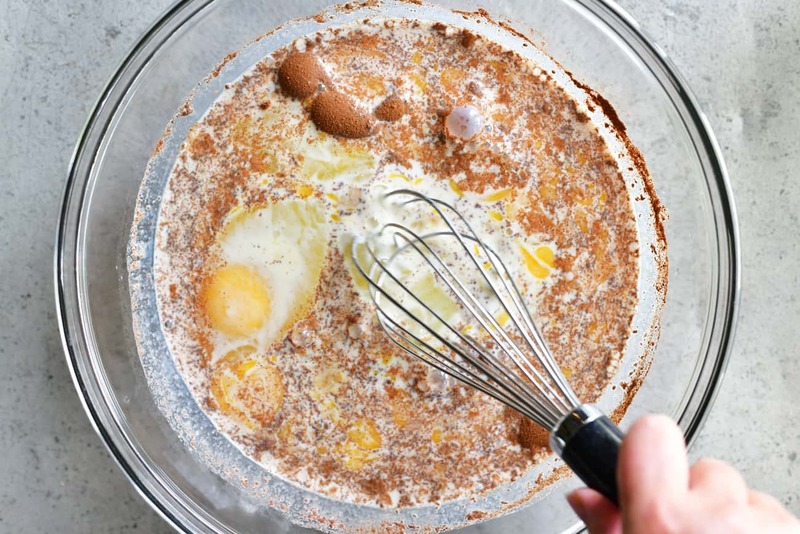 Whisk together eggs, half-n-half, milk, granulated sugar, vanilla, ground cinnamon, and ground nutmeg. 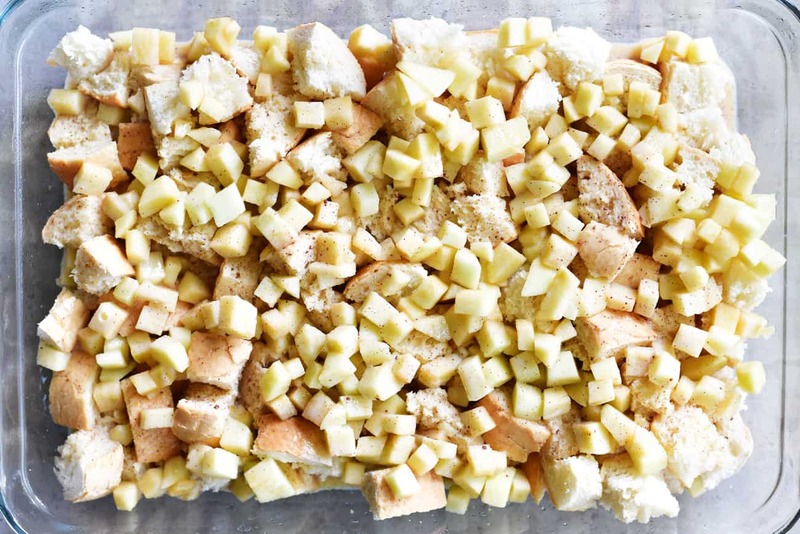 Pour the egg mixture over the bread cubes and apples in the pan. If preparing the night before, cover apple cinnamon french toast casserole at this point and place it in the fridge. 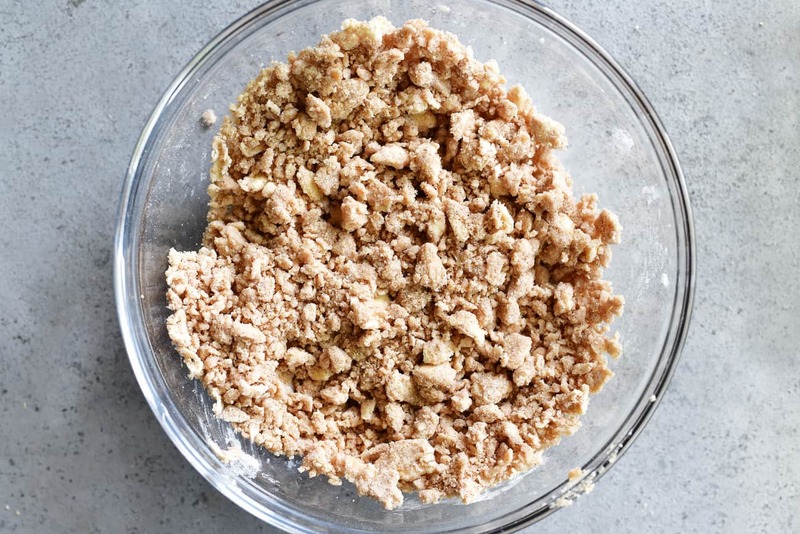 Continue onto the next steps to prepare the crumb topping but keep it separate until the morning. 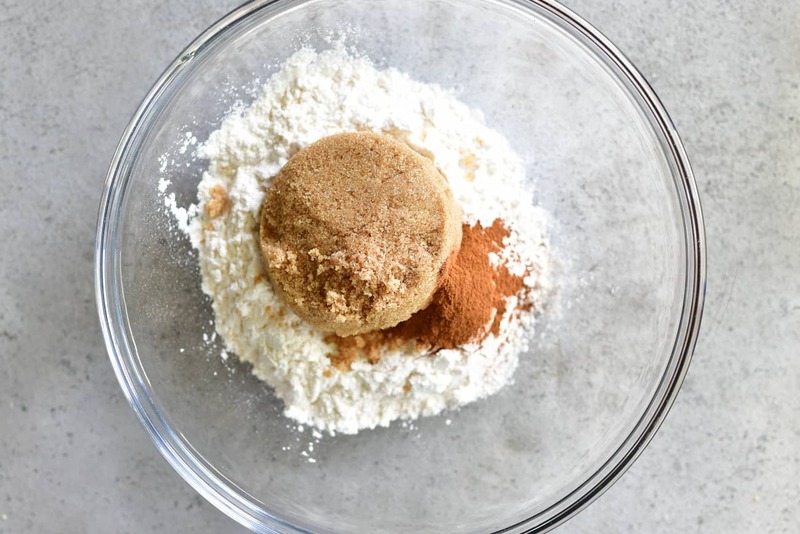 Combine flour, brown sugar, and ground cinnamon in a small bowl. 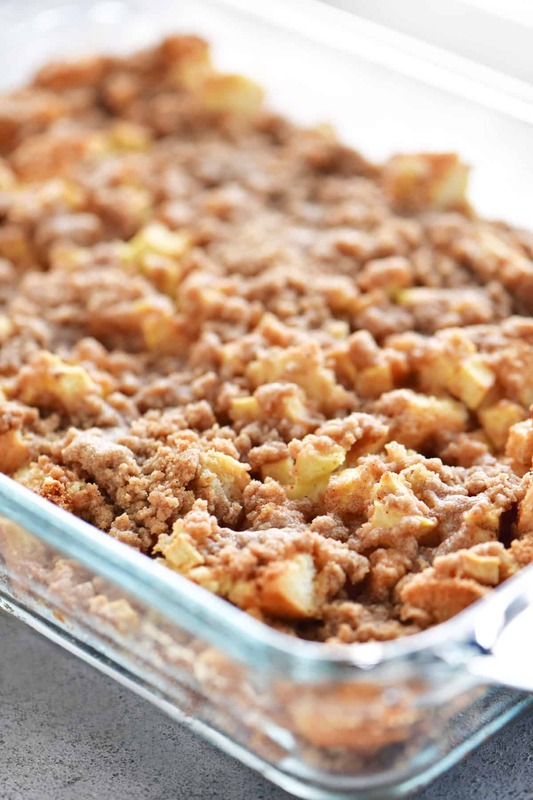 Sprinkle over the top of the apple cinnamon french toast casserole. Bake at 350˚F for 40-45 minutes. 1. What kind of apples should I use? For this recipe choose firm apples that hold up when baked. Try Honeycrisp, Braeburn, Granny Smith, Cortland, Empire, Fuji, Golden Delicious, Jonagold, or Jonathan. 2. What kind of bread should I use? Choose a sturdy bread that won’t turn to mush when it soaks up the egg mixture. I used French bread for this recipe but you could also use Italian bread, brioche, sourdough, ciabatta or even croissants. 3. Is 40-45 minutes enough time to fully cook the apples? 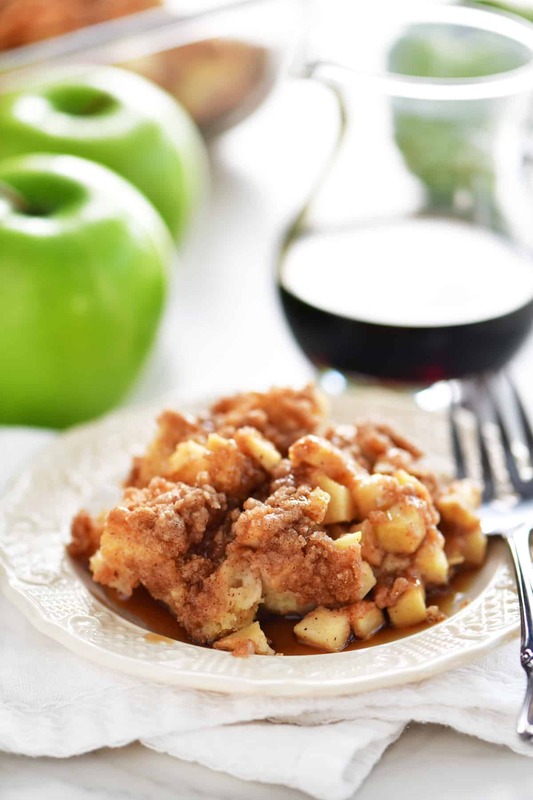 If you want to ensure that your apples are soft, you can cook them in the microwave for 2-3 minutes before adding them to the french toast casserole. 4. 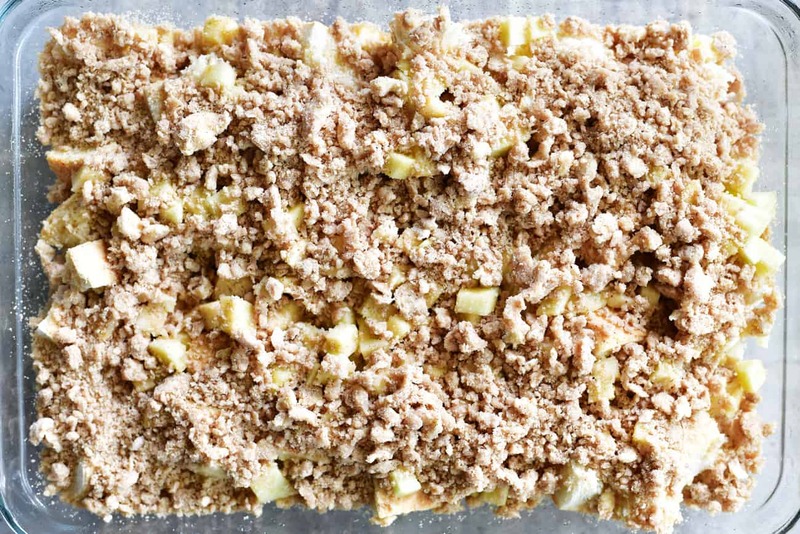 Can this apple cinnamon french toast casserole be made ahead of time? Yes, but here are a few suggestions. Cook the diced apples slightly in the microwave (see above) before adding them to the casserole so help prevent browning overnight. Prepare the crumb topping but keep it separate from the french toast casserole and add it right before baking. Looking For More Breakfast Recipe? We’ve Got You Covered! Pumpkin Caramel Pecan Baked French Toast: This Pumpkin Caramel Pecan Baked French Toast recipe is irresistibly good and is perfect for serving to overnight guests or at a holiday brunch! Tater Tot Breakfast Pizza: Tater Tot Breakfast Pizza recipe with crispy potatoes, scrambled eggs, melted cheese, crispy bacon, and sausage is a delicious breakfast or holiday brunch! Eggnog French Toast Bake: This Eggnog French Toast Bake is the perfect breakfast for overnight guests, holiday brunch, or Christmas morning! Its an easy French Toast Casserole recipe can even be prepared the night before and is a great way to feed the whole family in one fell swoop. Breakfast Pizza with Hash Brown Crust: This delicious recipe for breakfast pizza with a hash brown crust can be made for breakfast or as an easy dinner. It is topped with bacon, ham, and cheese. 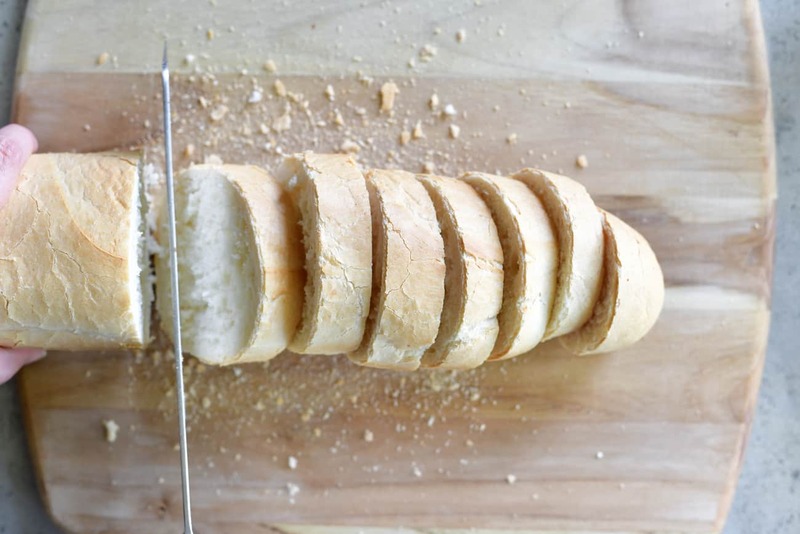 Cut the French bread into slices and then into cubes. Spread out in an even layer in a greased 9×13 inch pan. Are there some ingredients missing in your Apple Cinnamon French Toast…..? ?Combine flour, brown sugar, and ground cinnamon in a small bowl. 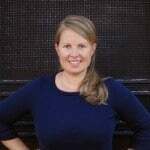 Cut in cold butter until crumbly…not butter quantity listed. Thank you for bringing that to my attention. It has been updated.